The push by the International Society of Weekly Newspaper Editors to encourage weekly papers to send their front pages to the Newseum paid off quickly. The site has rarely published front pages from weekly papers, but after 130 weeklies sent their fronts to the Newseum on Thursday, the site agreed to change "its policy to include weeklies in its Today’s Front Pages exhibit," Barbara Selvin reports for The Poynter Institute. Now, any newspaper can email frontpages@newseum.org for instructions on how to participate. "The Newseum’s written policy limited participation to daily newspapers, a restriction that has long irked weeklies’ editors and publishers. The U.S. has approximately 1,380 daily and 6,000 weekly newspapers," Selvin writes. Dan Robrish, right, who started The Elizabethtown (Pa.) Advocate in 2010, told her, "The Newseum is supposed to be a museum about news, not about metropolitan news, not about daily news specifically. It seems like a ridiculous decision to make." Selvin adds, "Especially, perhaps, since the Newseum had allowed newspapers that reduced their print publication schedules to three days a week to continue contributing to the exhibit." By industry convention, papers with a such a schedule have long been classified as weeklies. Jonathan Thompson, the Newseum’s senior manager of media relations, told Selvin, “When people get together like this and feel strongly about a specific issue, and mobilize and make specific arguments, it does have an impact." The problem has gotten so bad that Congress this year appropriated $20 million to find a solution, which includes the 2014 International Wild Pig Conference held this week in Alabama, Agri-Pulse writes. "APHIS aims to have its program operating within 6 months, with about half of the funds going toward state projects. The rest will be used to set up procedures for disease monitoring, including the development of new surveillance and vaccination methods, research and administration. Funding levels for state projects will be based on current feral swine population estimates." Nolte said the goal is to eliminate the problem in two states every three to five years. Agri-Pulse is subscription only, but a free trial is available by clicking here. Natural gas prices more than doubled "over the past two years in response to a tighter market," opening the door for coal to regain popularity, Cockerham writes. That led to the use of natural gas for power generation dropping in 2013 for the first time in five years. "The Arctic blasts of this year’s winter also pushed power plants to turn to coal in order to meet the nation’s record-setting heating requirements." "There’s serious doubt whether the resurgence in coal can last in America with stricter environmental rules coming. But the global outlook for coal is bright, and U.S. coal producers hope to take advantage by increasing exports to other countries hungry for cheap energy. The IEA believes coal will be the No. 1 fuel for meeting the worldwide increase in energy demand." The Association of Health Care Journalists has scheduled its seventh annual Rural Health Journalism Workshop for June 6 in Portland, Oregon. The free workshop, which will focus on covering rural health in America, "will bring journalists together with health care and policy experts who focus on the medical challenges of rural areas," AHCJ says. The workshop, hosted by Oregon Health & Science University and sponsored by the Robert Wood Johnson Foundation and the Missouri Foundation for Health, will run from 8 a.m. to 4:30 p.m. at the DoubleTree by Hilton, and will include lunch and dinner. Some travel assistance is available. The deadline to register is May 28. For more information or to register click here. Coal Camp Documentary Project seeks to glean, share histories of company towns in Eastern Ky. The Appalachian Center at the University of Kentucky has launched an interactive website that educates and gathers information about historic coal-company mining towns in Eastern Kentucky. The Coal Camp Documentary Project seeks memories or images related to experiences in company towns or villages in the region. Coal companies constructed and managed the built environment, which shaped much of the social and economic life of the residents. Each coal camp had a similar structure (housing that residents did not own, stores that used company “scrip” for currency, and alignment with railroad tracks) but its own way of life. Most coal camps have disappeared but are re-created at reunions of former residents and their descendants. Stories and images shared at those reunions may be found on the website, as well as archived materials. 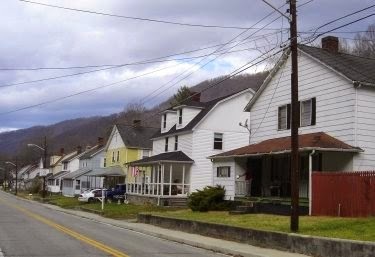 The site was created in response to community requests for Appalachian Center faculty, postdoctoral scholars, staff members and documentarians to record the memories shared by former coal-camp residents. For more information about the site or to learn more about how to participate, visit the center online or contact program coordinator Shane Barton at shane.barton@uky.edu. Do you live near a plant with dangerous chemicals? Exactly one year after the West Fertilizer explosion that killed 14 and injured more than 300, millions of Americans continue to "live near a site that could put them in harm's way if hazardous chemicals leak or catch fire," Jaeah Lee reports for Mother Jones. "The Environmental Protection Agency monitors roughly 12,000 facilities that store one or more of 140 toxic or flammable chemicals that are potentially hazardous to nearby communities. In late 2012, a Congressional Research Service report found that more than 2,500 of these sites estimate that their worst-case scenarios could affect between 10,000 and 1 million people; more than 4,400 estimated that their worst-case scenarios could affect between 1,000 and 9,999 people." More than three years after the Environmental Protection Agency issued limits on mercury and other toxic substances coming from coal-fired power plants, a federal appeals court on Tuesday upheld the decision. The three-judge panel denied "challenges from states, utilities and industry groups that argued the rules came out of a flawed regulatory process and illegally imposed exorbitant costs on power producers that will force dozens of power plants to shut down," Erica Martinson reports for Politico. "The court upheld EPA’s decision to take into account environmental damage from the pollutants, rather than just health-based harms, when it decided to regulate. And the agency based its decision on the impacts of hazardous pollution broadly, rather than just emissions from power plants — a commonsense approach,' wrote Judge Judith Rogers, to 'statutory ambiguity' that was within the bounds of EPA’s discretion." EPA originally determined in December 2000 "that it was 'appropriate and necessary' to regulate hazardous air pollutants from coal- and oil-fired power plants under Section 112 of the Clean Air Act," Martinson writes. "The George W. Bush administration reversed that decision in 2005, but . . . a court that ruled the move was unlawful." The Obama administration pushed for a new rule, which EPA issued in December 2011. Male farmers are four times more likely to attempt suicide than men in other professions, Max Kutner reports for Newsweek magazine, which recently revived its print edition. "For decades, farmers across the country have been dying by suicide at higher rates than the general population. The exact numbers are hard to determine, mainly because suicides by farmers are under-reported (they may get mislabeled as hunting or tractor accidents, advocates for prevention say) and because the exact definition of a farmer is elusive." Robert Fetsch, a retired professor of human development and family studies at Colorado State University, told Kutner, "Farmers are extremely self-sufficient and independent and tend to work around whatever they have, because they are so determined to keep moving." Farmers are watching the clash between Russia and Ukraine because the latter is the world's third largest corn exporter and sixth largest wheat exporter, and Russia is fifth in wheat and a big purchaser of corn and poultry. "From rising global commodity prices to potential supply disruptions, there’s a lot at stake in the conflict for American farmers and producers," Kevin Hall reports for McClatchy Newspapers. "Before the conflict, Ukrainian corn farmers had access to loans and were on a pace to eventually rival the U.S. corn belt as well as big producers such as Brazil. The loans now come with tougher conditions." "So far this year, 35 states have considered bills and resolutions regarding unmanned aerial vehicles," Johnson reports. "Most of them are privacy protection measures that would restrict the use of drones and set limits on the collection and storage of data." The University of North Dakota has expanded its program to airline-pilot training program to train students to operate drones. "It was the first university to offer a degree in this field," Johnson notes. "50 students have graduated and another 100 are enrolled in the program. In a partnership with the university, the Grand Forks sheriff and police departments are already using drones in the northeastern quarter of the state." Drone flights are overseen by Alan Frazier, a UND associate professor in charge of the Law Enforcement Unmanned Aircraft Systems Research Project, and a Grand Forks deputy sheriff, Johnson writes. "Frazier reports to a university compliance panel that specified five situations in which drones may be used: to search for lost people; perform post-disaster assessments; photograph crime and accident scenes; search for crime suspects who pose a risk to public safety; and assist with traffic control at major events." "When a request comes in, Frazier gets FAA authorization for the flight," Johnson writes. "Then Frazier or another trained operator launches one of four small drones to aid law enforcement." He also trains pilots, "tests the drones during actual incidents and later assesses the effectiveness for the FAA and the two manufacturers." Drones are cheap. "The Association of Unmanned Vehicle Systems International, a trade group for the drone industry, says the cost of a small UAV is less than $50,000, or about the price of a patrol car. It estimates operating costs at $25 to $75 an hour, compared to $200 to $400 per hour for a police helicopter." For years honeybees, which pollinate many crops, have been dying off in record numbers from a deadly virus and probably other causes. The bees are losing about a third of their population each year, with U.S. beekeepers losing 45 percent of their colonies during the 2012-2013 winter. Factors include the Varroa mite, pesticides, lack of genetic diversity, declining forage areas and diseases. Some groups have called for a ban on pesticides. In an attempt to reverse the deadly trend and save the bees Bayer CropScience, a maker of pesticides linked to bee deaths, on Tuesday held the grand opening of its $2.4 million, 6,000-square-foot Bee Care Center in Research Triangle Park, N.C., reports Agri-Pulse, a Washington newsletter. "Bayer will develop products and technology to control parasitic mites in honey bee hives, help manage a healthy-bees program, and assess the safety of crop protection products to bees." Agri-Pulse is subscription only, but a free trial is available by clicking here. Some great rural journalism is included in the Sigma Delta Chi Awards for Excellence in Journalism in 2013, presented by the Society of Professional Journalists. 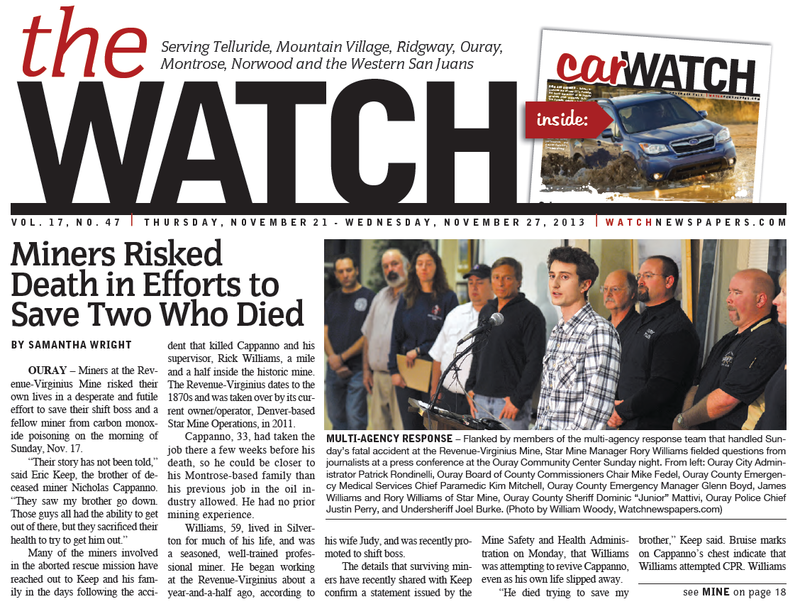 Samantha Wright and The Watch of Telluride, Colo., won the award for deadline reporting for non-daily newspapers for her story about miners who risked their lives in an unsuccessful effort to save two co-workers following an accident at a silver, gold and sulfide minerals mine near Ouray. Also on the mining front, among daily newspapers with circulations of up to 50,000, Joe O'Sullivan and Daniel Simmons-Ritchie of the Rapid City Journal won the public-service award for their series, "South Dakota takes a hands-off approach to uranium mining." The award for online investigative reporting went to “Out of Breath: The Untold Story of Big Money, Black Lung and Doctors for the Coal Companies,” by Chris Hamby of the Center for Public Integrity and ABC News. The series won the Pulitzer Prize for investigative reporting earlier this week, but only for Hamby; ABC complained, and CPI replied. Jim Steinberg, Rachel Luna and Paul Penzella of the San Bernardino Sun won the award for non-deadline reporting by a small daily, for "Ghost Town," a story about Hinckley, Calif., fading away after toxins from a utility company polluted its groundwater. The award for newspapers of up to 100,000 circulation was won by Dave Philipps of The Gazette in Colorado Springs, who won the Pulitzer for national reporting for his series on treatment of veterans with "other than honorable" discharges. The San Bernardino Sun also won the award for editorial writing in newspapers of up to 100,000 circulation for Jessica Keating's editorials on the city's recovery from bankruptcy. In the same size category, Mark Harmon of the Knoxville News-Sentinel won for column writing. Louise Knott Ahern, Dave Wasinger and Rod Sanford of the Lansing State Journal won the award for feature reporting by small dailies for "Silence of the Wolves," about the plight of inbred wolves in Isle Royale National Park on Lake Superior. 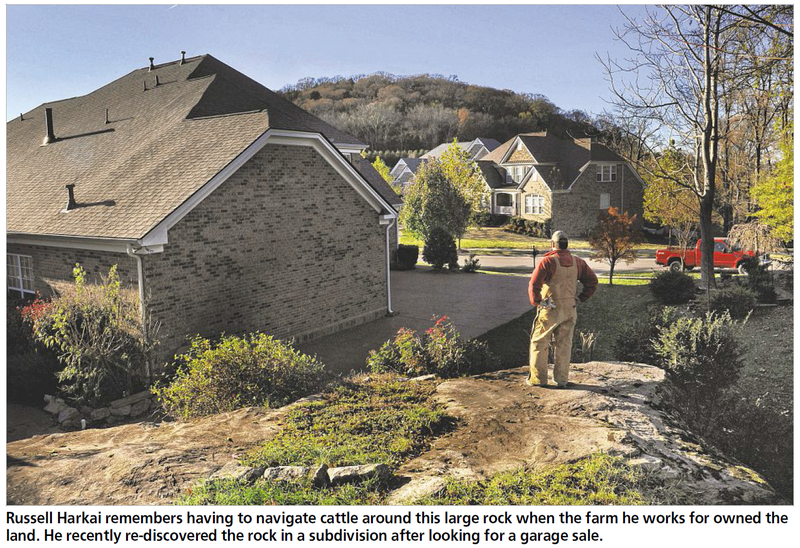 John Partipilo of The Tennessean won the feature-photography award for dailies up to 100,000 for a package illustrating how rural ways of life are fading in fast-suburbanizing Middle Tennessee. The story by Duane Gang was good, too, and informed the caption below. In broadcasting, Brian Mann of North Country Public Radio in New York was a double winner among journalists in small markets. His report with David Sommerstein, on the dangers of oil trains in the wake of a catastrophic explosion in nearby Quebec, won the award for public service in small markets, Nos. 101 and larger. He and Natasha Haverty also won for their investigative report “From Birth to Death Behind Bars.” The award for public-service radio in large markets was won by environmental reporter Erica Peterson of WFPL in Louisville for a series on black carbon. Other rural radio winners included breaking-news coverage of the Moore, Okla., tornado by KGOU, KOSU, StateImpact Oklahoma and Oklahoma Public Media Exchange; investigative reporting of an Oregon county's budget problems by Amelia Templeton, Eve Epstein and Michael Clapp of Oregon Public Broadcasting; small-market by Natasha Haverty and Brian Mann of North Country Public Radio in New York; feature reporting, “Wild Goose Church,” by Robbie Harris and Connie Stevens of Nashville's WVTF and Radio IQ; and the documentary “Kentucky Dam: Power for the People,” by Todd Hatton and Chad Lampe of WKMS-FM in Murray. Television winners in small markets (Nos. 51 and above) included the staff of KWTX-TV in Waco for breaking-news coverage of the fertilizer plant explosion in West, Tex. ; for public service, “The Compassion Project,” by Jennifer Livingston, Mike Thompson and Anne Paape of WKBT-TV in La Crosse, Wis., Alex Rozier, Gabe Ferguson and Jordan Caskey of KHQ in Spokane for “The Climb For Closure,” a documentary about a mountain climber; and Mary Sturgill, Patrick Owens, Vanessa Holmes and Chase Conner of KBMT in Beaumont, Tex., for “Asher's Story,” a documentary about a small boy overcoming child abuse. The award for public service in online journalism by an affiliated site went to John Sutter and Edythe McNamee of CNN for “The Most Unequal Place in America,” about income inequality in East Carroll Parish, Louisiana. The winners will be honored at an awards banquet on June 21 at the National Press Club in Washington, D.C.
Highland County High School, located in the least populated county in Virginia, faced budget cuts last year that forced the school, which has about 100 students, to eliminate several positions, including the foreign language teacher. That made the school an unlikely but perfect place for the Virginia Department of Education to unveil a prototype Tuesday for online language classes, David Kaplan reports for WDBJ in Roanoke. Virginia students will be the first in the country to use the program, which will be introduced into classes in the fall. A pair of studies on childhood obesity that examined the same data from the National Health and Nutrition Examination Survey for children ages 2 to 5 resulted in different conclusions, with one study saying child obesity has significantly declined and the other saying that's not the case, Sabrina Tavernise reports for The New York Times. A federal study published in The Journal of the American Medical Association claims that child obesity in that age group has fallen dramatically since 2004. While researchers at the University of North Carolina don't dispute that claim, they point to a spike in obesity in 2003 that makes it look like numbers have significantly dropped, and that if one goes back to 1999, there has been no significant change in the past 15 years. The federal study found that obesity among children ages 2 to 5 dropped from 2004 to 2014 from 14 percent to 8 percent, which is "the first statistically significant decline for any group," Tavernise writes. The North Carolina study, published in JAMA Pediatrics, counters that in 1999-2000 the obesity rate among those ages 2 to 5 was 10.3 percent, meaning the drop from 1999 to 2012 was significantly lower than the drop from 2004 to 2012. The rate was 10.6 percent in 2001-02, then jumped to 13.9 percent in 2003-04, before dropping back to 10.7 percent in 2005-06 and 10.1 percent in 2007-08. A proposed rule by the National Labor Relations Board that would reduce the collective-bargaining election process from 42 days to between 10 and 21 days is drawing opposition from the poultry industry, which claims workers won't have enough time to be properly educated about unions, reports Agri-Pulse, a Washington newsletter: "Supporters claim the current amount of time employers have is being used to essentially 'browbeat' employees into voting against unionization." AFL-CIO President Richard Trumka "argues that the proposed rule is needed to reduce delay in the NLRB election process," Agri-Pulse reports. Trumka told the newsletter, “When workers petition for an NLRB election, they should receive a timely opportunity to vote. But the current NLRB election process is riddled with delay and provides too many opportunities for employers to manipulate and drag out the process through costly and unnecessary litigation and deny workers a vote.” Agri-Pulse is subscription only, but a free trial is available by clicking here. The federal government estimates that this year's U.S. farm income will drop 26.6 percent from last year as a result of reduced corn and soybean prices. In Iowa, farmers' income will be around $7.4 billion this year, dropping 31 percent from the $10.9 billion record in 2011, Donnelle Eller writes for The Des Moines Register. "We're figuring our break-even prices pretty closely," said Craig Boot, who farms several hundred acres near Pella. Mike Duffy, an Iowa State University farm economist, said when expected income increases, farmers will more likely replace equipment, but when income is lower, they'll wait. Deere & Co., a large manufacturer, expects a 5 to 10 percent reduction in farm machinery sales this year. Besides the projected income drop, farmers also worry about drought conditions affecting approximately 75 percent of the state and the undesirably cold temperatures causing a frost. 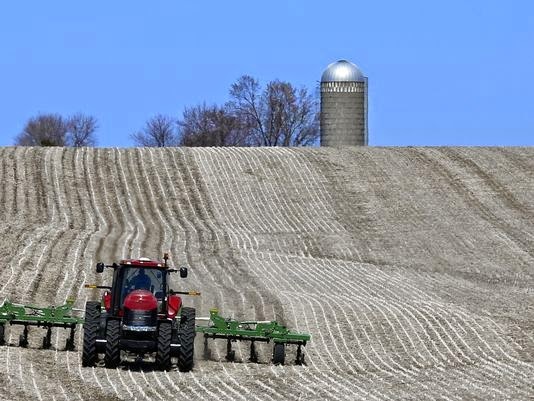 "There are a few planters in yards, but it's been cold enough that most are waiting for soil temperatures to get warmer," said Bill Northey, Iowa's secretary of agriculture. "As much of the nation shifts to adding soybean acres, many Iowa farmers say they're sticking with their typical rotation schedule," Eller writes. "Experts say the increase of corn and soybean acres represents a return to production land that wasn't planted last year because conditions were too wet." Iowa farmers plan to plant 400,000 more acres of corn than last year and 300,000 more acres of soybeans. According to the U.S. Department of Agriculture, only six states other than Iowa will be planting more corn acres than last year. Julius Schaaf, a farmer in southwest Iowa said deciding a price for selling corn and soybeans is the "toughest part of farming." "Paying attention to the market will be critical this year to maintain profitability on the farm," said Schaaf. "If a person sees some level of profitability, they should be sure to take some of that off the table, to hedge against the risk of lower prices." The Tennessee Senate passed an anti-methamphetamine bill Tuesday night that sets lower monthly and yearly limits than the one passed last week by the House. The Senate bill limits monthly purchases of pseudoephedrine, a key ingredient in making meth, to 4.8 grams, and in one year to 14.4 grams. The House bill set limits of 5.8 and 28.8 grams. More than 900 newspaper front pages from 90 countries are available for viewing every day on Newseum. 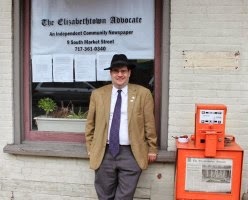 But few community newspapers are represented, notes Chad Stebbins, executive director of the International Society of Weekly Newspaper Editors. That's why ISWNE is urging community newspapers to send their front pages to Newseum on Thursday, in honor of the birthday of legendary Kansas community journalist Huck Boyd. "We are doing this because the Newseum has a terrible record on the topic of community journalism," Stebbins said in a email. "We hope to get some good publicity out of this and raise the awareness of community journalism." Pages can be emailed to frontpages@newseum.org. Participants are also asked to email ISWNE member Steve Thurston at heraldtrib@GMAIL.COM so that he can get a count of how many newspapers take part. Stories that focused on issues of rural importance were some of this year's winners and finalists in the Pulitzer Prize competition. Winning stories focused on investigations into coal miners' black-lung disease, food stamps and the treatment of veterans, while finalists included Iowa's licensing laws, the 19 Hotshot firefighters killed in Arizona and photos accompanying the food stamp story. Winners receive $10,000. Finalists included the Arizona Republic staff for its coverage of the Yarnell Hill wildfire, Andie Dominick of the Des Moines Register for her series of editorials on Iowa's job licensing laws and Post photographer Michael Williamson for his portfolio of pictures that accompanied Saslow's story, including the one above of 1-year-old Austin Davis. "Thirty-two states are now working together under the leadership of Kentucky Attorney General Jack Conway to investigate potential abuses in the for-profit college industry, which saw enrollment more than triple between 1998 and 2008, according to the Consumer Finance Protection Bureau," Adrienne Lu reports for Stateline. "One reason for the concern is the amount of taxpayer dollars involved: Some for-profit colleges receive 90 percent or more of their revenue from the federal and/or state governments in the form of student aid." Students at for-profit colleges account for 13 percent of all college students, but 31 percent of student loans and about half of loan defaults. In February, the Consumer Financial Protection Bureau, created in 2010, filed suit against for-profit ITT Educational Services, which operates about 150 institutions in nearly 40 states, "alleging predatory student lending," Lu writes. "The lawsuit was the bureau’s first public enforcement action against a for-profit college. Last year, New York Attorney General Eric Schneiderman won a $10.25 million settlement with the for-profit Career Education Corp. over inflated job placement rates." "In January, New York state’s Student Protection Unit issued subpoenas to 13 student-debt-relief companies as part of its investigation into whether the companies might be charging improper fees to enroll students in debt relief programs that are already available free through the federal government," Lu writes. Federal regulators may have severely underestimated the amount of methane from natural gas wells being released into the atmosphere,suggests a study published Monday in Proceedings of the National Academy of Sciences. The study of gas wells in southwestern Pennsylvania found rates were 100 to 1,000 times higher than estimates from the Environmental Protection Agency, Neela Banerjee reports for McClatchy Newspapers. "Using a plane equipped to measure greenhouse gas emissions in the air, scientists found that drilling activities at seven well pads in the Marcellus shale formation emitted 34 grams of methane per second, on average," significantly higher than EPA estimates of between 0.04 grams and 0.30 grams of methane per second, Banerjee writes. "Over two days in June 2012, they detected 2 grams to 14 grams of methane per second per square kilometer over the entire area. The EPA's estimate for the area is 2.3 grams to 4.6 grams of methane per second per square kilometer," Banerjee writes. "The researchers determined that the wells leaking the most methane were in the drilling phase, a period that has not been known for high emissions. Experts had thought that methane was more likely to be released during subsequent phases of production, including hydraulic fracturing, well completion or transport through pipelines." Rural unemployment rates have been on the rise, with the share of jobless in the most rural counties increasing from January to February from 7.9 percent in January to 8.6 percent in February, according to Bureau of Labor Statistics data processed by the Daily Yonder. Unemployment in counties with 10,000 to 50,000 residents rose from 7.4 percent to 8 percent, and unemployment in metro areas rose from 6.9 percent to 7.4 percent. "During the early years of the recession, which began in late 2007, rural areas often had lower unemployment rates than cities. In the last few years, however, unemployment rates in rural America have surpassed those in metropolitan counties," Bill Bishop writes for the Yonder. "The reason the unemployment rates in micropolitan and rural counties dropped at all over the last year, despite only a slight gain in the number of jobs, is that there are fewer people looking for work." On Friday the Ohio Department of Natural Resources announced that hydraulic fracturing and injection wells are the probable cause of earthquakes in the Poland Township of Mahoning County. This seems to be the first time state officials have gone on record connecting the recent upsurge in earthquakes in fracking areas to the practice, Bob Downing reports for the Akron Beacon Journal. Mahoning County doesn't have a history of seismic activity but had five earthquakes of magnitude 2.0 or greater on March 10 and 11. As a result of the decision, "New permits for drilling within three miles of a known underground geologic fault or area of seismic activity greater than 2.0 magnitude will require companies to install seismic monitors," Downing writes. "The order would affect any quakes since 1999 that were recorded at magnitude 2.0 or greater. If those monitors detect a quake of 1.0 magnitude or greater, drilling activities would be halted while the cause is investigated. If that investigation reveals a probable connection to hydraulic fracturing, all well completion operations will be suspended." Most highways are located in rural areas, and rural drivers are often the ones least likely to wear seat belts. The National Highway Traffic Safety Administration's annual "Click it or Ticket" campaign to encourage drivers to wear seat belts isn't scheduled until May, but some rural areas got a head start with local campaigns focused on their areas. Colorado ran a Click It or Ticket rural enforcement period from March 31 to April 6. The partnership between the state Department of Transportation, Colorado State Patrol and 29 rural law enforcement agencies netted more then 1,700 citations in 25 rural communities for not buckling up, Erin Udall reports for the Coloradoan. While the state patrol gave out the most citations, 957, the most given by a local organization was the Alamosa County Sheriff’s Office, which issued 87. During last year's campaign 1,578 people were ticketed for not wearing a seat belt, with 88 percent over the age of 21, reports KKTV in Colorado Springs. Minnesota also held a similar campaign in March, with state troopers giving out "more than 500 tickets in Southeast Minnesota alone for people who didn't buckle up," Hannah Tran reports for KAAL-TV. The Minnesota campaign was started in response to statistics that found that 75 percent of Minnesotans don't use child seats properly, and 50 percent of all traffic fatalities involve drivers and passengers not wearing seat belts, reports WDAZ in Grand Forks, N.D.
"Tom Gish was the publisher and editor of the weekly newspaper, but Pat Gish was his inseparable partner in putting out the publication, which bucked entrenched local powers, exposed corruption and was the first newspaper in Eastern Kentucky to seriously challenge the abuses of surface mining," reports the Lexington Herald-Leader's Bill Estep, who briefly worked for the Gishes. "Along the way, the newspaper was recognized as one of the best rural newspapers in the nation." The Gishes bought the paper in 1956 and published their first issue in January 1957. "At the time, the county fiscal court and school board met in private," Estep writes. "Tom and Pat Gish pried open the meetings, then went on to cover everything from poor education and housing to poverty, corruption and safety and environmental problems in the coal industry, the reigning power in the mountains at the time. The newspaper's tough coverage cost them advertising, and after stories in 1974 about local police mistreating young people, a police officer paid arsonists to throw a kerosene firebomb through a window at the newspaper, destroying the building. It didn't shut down the paper, however." The next week, its motto, "It Screams," was changed to "It Still Screams." Laurie Ezzell Brown of The Canadian Record in Texas, part of a family that won the Gish Award after the first one, which went to the Gishes, said: "We are diminished today by the death of Pat Gish. She and her husband, Tom, were real journalistic warriors of the kind too rarely seen in this age in which news is 'monetized' and valuable reporting resources are allocated according to page clicks. Pat and Tom Gish reported the real news, regardless of whether it was either profitable or popular—and despite considerable risk to both life and livelihood. We need many more just like them." UPDATE: For a nice tribute to Pat, by Daily Yonder Publisher Dee Davis, click here. University of North Carolina professor Mark Holmes studied the economic impact of 140 rural hospital closures nationwide, finding that "Three years out, losing a hospital costs a community, on average, 'about 1.6 percentage points in unemployment, about $700 in per capita income, and that was in 2000 dollars, so that’d be probably about $1,000 currently,'" Ragusea writes. Saturday marked the one-year anniversary of the fertilizer plant explosion in West, Tex., that killed 14 and injured more than 300. In the year since the explosion the government has studied ways to improve regulations in storing chemicals. But health and public policy experts argue that a substandard survey on the number of injured will hamper the government's ability to make informed public safety decisions in creating the regulations, Sue Ambrose reports for The Dallas Morning News. "They limited their survey to those treated at hospitals and urgent care clinics. They did not canvass private medical practices, where blast victims were also treated. Nor did they track problems that may have surfaced later, such as brain injuries, hearing loss and post-traumatic stress disorder," Amrbose writes. "State and local health officials say their survey was designed to record only acute—or immediately apparent—physical injuries from the blast." Officials say 262 people were injured in the explosion, but the Morning News said that through phone calls it was easily able to find more people not included in the survey. "Using the Texas Medical Board’s registry, The News found 432 private-practice doctors within 60 miles of West who could have treated blast injuries," Ambrose writes. "There were an additional 28 neurologists and psychiatrists in the same area who could treat patients." The Cowboy and Indian Alliance is sending a message to President Obama urging him to reject the controversial $5.4 billion TransCanada Corp. Keystone XL Pipeline that would carry heavy tar-sands oil across the U.S. The group has created a crop-art image the size of 80 football fields near Neligh, Neb., right in the proposed pipeline path, Mark Hefflinger reports for Bold Nebraska, a citizen advocacy group fighting the project. Last year Republican Gov. Dave Heineman endorsed legislation to allow the pipeline to cross the state, but in February a state court invalidated the decision. The Housing Assistance Council report that homeless U.S. veterans in rural areas suffer from geographic isolation, making it difficult for them to get help, Leo Shane reports for the Navy Times. Another problem is that veterans in rural areas are, on average, 18 years older than those in urban areas and "face challenges in paying for property upkeep and modernization, which can force them into substandard living conditions." In 10 years 70 percent of all rural veterans will be over 65 years old, according to the council's report, "From Service to Shelter." Though the number of homeless veterans was down to 57,849 in January 2013, and President Obama wants no U.S. veterans to be homeless by the end of 2015, "declaring victory in rural areas is much more difficult," Shane writes. "In many towns far from urban centers, housing options are sparse," and Department of Veterans Affairs services are harder to get. Eric Oberdorfer, research associate at the council, told Shane, "Because many live far away from VA offices and other resources, they can’t access them, or they might not even be aware that programs exist.” About 5.6 million veterans, or 25 percent of all veterans, are from rural areas as of 2010, the report states.